When blessed Andrew was come to the place where the cross was prepared, he cried out, and said: O good-cross, long desired, and now ready for my longing mind; I come to thee with joy and confidence; do thou also joyfully receive me, a disciple of him, who hung on thee. We humbly beseech thy divine Majesty, O Lord, that as the blessed Apostle Andrew was a teacher and pastor of thy church, so he may be with thee our perpetual intercessor. Through our Lord Jesus Christ, thy Son, who liveth and reigneth with thee, in the unity of the Holy Ghost, God, world without end. Amen. This feast is destined each year to terminate with solemnity the cycle which is at its close, or to add lustre to the new one which has just begun. It seems, indeed, fitting that the Christian year should begin and end with the cross, which has merited for us each of those years which it has pleased the divine goodness to grant us, and which is to appear, on the last day, in the clouds of heaven, as the seal put on time. We should remember that Saint Andrew is the Apostle of the Cross. To , Jesus has given firmness of faith; to John, warmth of love; the mission of Andrew is to represent the Cross of his divine Master. Now it is by these three, faith, love, and the Cross, that the Church renders herself worthy of her Spouse. Everything she has or is, bears this threefold character. Hence it is that after the two Apostles just named, there is none who holds such a prominent place in the universal Liturgy as Saint Andrew. But let us read the life of this glorious fisherman of the lake of Genesareth, who was afterwards to be the successor of Christ himself, and the companion of Peter, on the tree of the Cross. The Church has compiled it from the ancient Acts of the Martyrdom of the holy Apostle, drawn up by the priests of the Church of Patræ, which was founded by the Saint… These Acts have been received by a far greater number of Catholic writers of eminence; amongst whom may be mentioned the great Baronius, Labbe, Natalis Alexander, Gallandus, Lumper, Morcelli, etc. The Churches, too, of both East and West, which have inserted these Acts in their respective Offices of St. Andrew, are of some authority, as is also St. Bernard, who has made them the groundwork of his three admirable sermons on St. Andrew. Not long after this, he was brought before the tribunal, where he began to extol the mystery of the Cross, and rebuke the judge for his impiety. Ægeas, no longer able to contain himself on hearing these words, ordered him to be hoisted on a cross, and so to die like Christ. Andrew having been brought to the place of execution, seeing the Cross at some distance, began to cry out: O good Cross, made beautiful by the body of my Lord! so long desired, so anxiously loved, so unceasingly sought after, and now at last ready for my soul to enjoy! take me from amidst men, and restore me to my Master, that by thee He may receive me, who by thee redeemed me. He was therefore fastened to the cross, on which he hung alive two days, preaching without cessation the faith of Christ: after which he passed to Him, whose death he had so coveted. The Priests and Deacons of Achaia, who wrote his Passion, attest that all the things which they have recorded were heard and seen by them. His relics were first translated to Constantinople, under the emperor Constantius, and afterwards to Amalfi. During the Pontificate of Pius II, the head was taken to Rome, and placed in the Basilica of St. Peter. *Come after me, and I will make you to be fishers of men. *He followed Him who gives the reward of eternal life. ℣. This is he who, for the love of Christ, hung upon a cross, and for his law endured a passion. ℟. Andrew, the good Teacher, and the friend of God, is led to the Cross; which, seeing afar off, he says: Hail, O Cross! *Receive the disciple of Him who hung upon thee, Christ, my master. ℣. Hail, O Cross, which art consecrated by the body of Christ, and art adorned by his members as with pearls. ℟. Andrew seeing the Cross, cried out, saying: O admirable Cross! O desirable Cross! O Cross which shinest throughout the whole world! *Receive the disciple of Christ, and by thee may He receive me, who dying by thee redeemed me. ℣. O good Cross, which art made fair and beautiful by the body of the Lord. *For I have learnt the power of the holy Cross. ℣. Thou art the Christ my master, whom I have loved, whom I have known, whom I have confessed: graciously hear me in this one prayer. Another account of St. Andrew. St. Andrew was a native of Bethsaida, a town in Galilee, upon the banks of the lake of Genesareth. He was the son of Jonas, or John, a fisherman of that town, and brother to Simon Peter, but whether elder or younger the holy scriptures have not acquainted us. They had afterwards a house at Capharnaum, where Jesus lodged when he preached in that city. It is no small proof of the piety and good inclinations of St. Andrew, that when St. John Baptist began to preach penance in the desert, he was not content with going to hear him as others did, but became his disciple, passed much of his time in hearing his instructions, and studied punctually to practise all his lessons, and copy his example; but he often returned home to his fishing trade. He was with his master when St. John Baptist, seeing Jesus pass by the day after he had been baptized by him, said, “Behold the Lamb of God.” (St. John, i. 36) Andrew, by the ardour and purity of his desires, and his fidelity in every religious practice, deserved to be so far enlightened as to comprehend this mysterious saying, and, without delay, he and another disciple of the Baptist went after Jesus, who drew them secretly by the invisible bands of his grace, and saw them with the eyes of his spirit before he beheld them with his corporal eyes. Turning back as he walked, and seeing them follow him, he said, “What seek ye?” They said, they desired to know where he dwelt; and he bade them come and see. There remained but two hours of that day, which they spent with him, and, according to several fathers, the whole night following. “O how happy a day, how happy a night did they pass!” cries out St. Austin. “Who will tell us what things they then learned from the mouth of their Saviour! Let us build ourselves a dwelling for him in our hearts, to which he may come, and where he may converse with us.” For this happiness is enjoyed by a soul which opens her affections to God, and receives the rays of his divine light in heavenly contemplation. Andrew, who loved affectionately his brother Simon, called afterwards Peter, could not rest till he had imparted to him the infinite treasure which he had discovered, and brought him to Christ, that he might also know him. Simon was no sooner come to Jesus, but the Saviour of the world admitted him as a disciple, and gave him the name of Peter. The brothers tarried one day with him to hear his divine doctrine, and the next day returned home again. From this time they became Jesus's disciples, not constantly attending upon him, as they afterwards did, but hearing him frequently, as their business would permit, and returning to their trade and family affairs again. Jesus, in order to prove the truth of his divine doctrine by his works, wrought his first miracle at the marriage at Cana in Galilee, and was pleased that these two brothers should be present at it with his holy mother. Jesus, going up to Jerusalem to celebrate the Passover, stayed some days in Judӕa, and baptized in the Jordan. Peter and Andrew also baptized by his authority, and in his name. Our Saviour being come back into Lower Galilee in autumn, and meeting one day Peter and Andrew fishing in the lake, before the end of the same year, he called them to a constant attendance upon the ministry of the gospel, saying, that he would make them fishers of men. Whereupon, they immediately left their nets to follow him, and never went from him again. The year following, the Son of God formed the college of his apostles, in which our two brothers are named by the evangelists at the head of the rest. Not long after, Jesus went down to Capharnaum, and lodged at the house of Peter and Andrew, and, at the request of them both, cured Peter's wife's mother of a fever, by taking her by the hand, and rebuking the fever, by which it left her. When Christ would not send away the multitude of five thousand persons who had followed him into the desert, till they were refreshed with some food, St. Philip said two hundred pennyworth of bread would not suffice. But Andrew seemed to express a stronger faith, saying, there was a boy who had five barley loaves and two small fishes—which, indeed, were nothing among so many—but Christ could, if he pleased to exert his power, seeing he was greater than Eliseus, who, with twenty loaves, fed a hundred men (IV or II Kings, iv. 43). “When Christ was at Bethania, at the house of Lazarus, a little before his Sacred Passion, certain Greeks who came to worship God at the festival, addressed themselves to Philip, begging him to introduce them to Jesus. Philip did not undertake to do it alone; but spoke to St. Andrew, and they both together spoke to their divine master, and procured these strangers that happiness. This shows the great credit St. Andrew had with Christ; on which account St. Bede calls him the Introductor to Christ, and says he had this honour, because he brought St. Peter to him. Christ having foretold the destruction of the temple, Peter, John, James, and Andrew asked him privately when that should come to pass, that they might forewarn their brethren to escape the danger. After Christ's resurrection and the descent of the Holy Ghost, St. Andrew preached the gospel in Scythia, as Origen testifies. Sophronius, who wrote soon after St. Jerom, and translated his catalogue of illustrious men, and some other works into Greek, adds Sogdiana and Colchis. Theodoret tells us, that he passed into Greece; St. Gregory Nazianzen mentions particularly Epirus, and St. Jerom Achaia. St. Paulinus says, this divine fisherman, preaching at Argos, put all the philosophers there to silence. St. Philastrius tells us, that he came out of Pontus into Greece, and that in his time people at Sinope were persuaded that they had his true picture, and the pulpit in which he had preached in that city. The Muscovites have long gloried that St. Andrew carried the gospel into their country as far as the mouth of the Borysthenes, and to the mountains where the city of Kiou now stands, and to the frontiers of Poland. If the ancients mean European Scythia, when they speak of the theatre of his labours, this authority is favourable to the pretensions of the Muscovites. The Greeks understand it of Scythia, beyond Sebastopolis in Colchis, and perhaps also of the European; for they say he planted the faith in Thrace, and particularly at Byzantium, afterwards called Constantinople. But of this we meet with no traces in antiquity. Several Calendars commemorate the feast of the chair of St. Andrew at Patrӕ, in Achaia. It is agreed that he laid down his life there for Christ. St. Paulinus says, that having taken many people in the nets of Christ, he confirmed the faith which he had preached by his blood at Patrӕ. St. Sophronius, St. Gaudentius, and St. Austin assure us that he was crucified; St. Peter Chrysologus says, on a tree; Pseudo-Hippolytus adds, on an olive-tree. In the hymn of Pope Damasus it is barely mentioned that he was crucified. When the apostle saw his cross at a distance, he is said to have cried out, “Hail, precious cross, that hast been consecrated by the body of my Lord, and adorned with his limbs as with rich jewels. I come to thee exulting and glad; receive me with joy into thy arms. O good cross, that hast received beauty from our Lord's limbs; I have ardently loved thee; long have I desired and sought thee: now thou art found by me, and art made ready for my longing soul; receive me into thy arms, taking me from among men, and present me to my master; that he who redeemed me on thee, may receive me by thee.” The body of St. Andrew was translated from Patrӕ to Constantinople in 357, together with those of St. Luke and St. Timothy, and deposited in the Church of the Apostles, which Constantine the Great had built a little before. St. Paulinus and St. Jerom mention miracles wrought on that occasion. The churches of Milan, Nola, Brescia, and some other places, were, at the same time enriched with small portions of these relics, as we are informed by St. Ambrose, St. Gaudentius, St. Paulinus, &c.
When the city of Constantinople was taken by the French, Cardinal Peter of Capua brought the relics of St. Andrew thence into Italy, in 1210, and deposited them in the Cathedral of Amalphi, where they still remain. Thomas the Despot, when the Turks had made themselves masters of Constantinople, going from Greece into Italy, and carrying with him the head of St. Andrew, presented it to Pope Pius II, in the year 1461, who allotted him a monastery for his dwelling, with a competent revenue, as is related by George Phranza, the last of the Byzantine historians. It is the common opinion that the cross of St. Andrew was in the form of the letter X, styled a cross decussate, composed of two pieces of timber crossing each other obliquely in the middle. That such crosses were sometimes used is certain; yet no clear proofs are produced as to the form of St. Andrew's cross. It is mentioned in the records of the duchy of Burgundy, that the cross of St. Andrew was brought out of Achaia, and placed in the nunnery of Weaune, near Marseilles. It was thence removed into the abbey of St. Victor, in Marseilles, before the year 1250, and is still shown there. A part thereof, inclosed in a silver case gilt, was carried to Brussels by Philip the Good, Duke of Burgundy and Brabant, who, in honour of it, instituted the Knights of the Golden Fleece, who for the badge of their Order, wear a figure of this cross, called St. Andrew's cross, or the cross of Burgundy. The Scots honour St. Andrew as principal patron of their country, and their historians tell us that a certain abbot, called Regulus, brought thither from Patrӕ, in 369, or rather from Constantinople some years later, certain relics of this apostle, which he reposited in a church which he built in his honour, with a monastery called Abernethy, where now the city of St. Andrew's stands. Usher proves that many pilgrims resorted to this church from foreign countries, and that the Scottish monks of that place were the first who were called Culdees. Hungus, King of the Picts, soon after the year 800, in thanksgiving for a great victory which he had gained over the Northumbrians, gave to this church the tenth part of all the land of his dominions. Kenneth II, King of the Scots, having overcome the Picts, and entirely extinguished their kingdom in North Britain, in 845, repaired and richly endowed the Church of St. Regulus, or Rueil, in which the arm of St. Andrew was reverently kept. The Muscovites say he preached the faith among them, and honour him as the principal titular saint of their empire. Peter the Great instituted under his name the first and most noble order of knighthood, or of the blue ribbon; leaving the project of a second Order of St. Alexander Newski, or of the red ribbon, to be carried into execution by his widow. 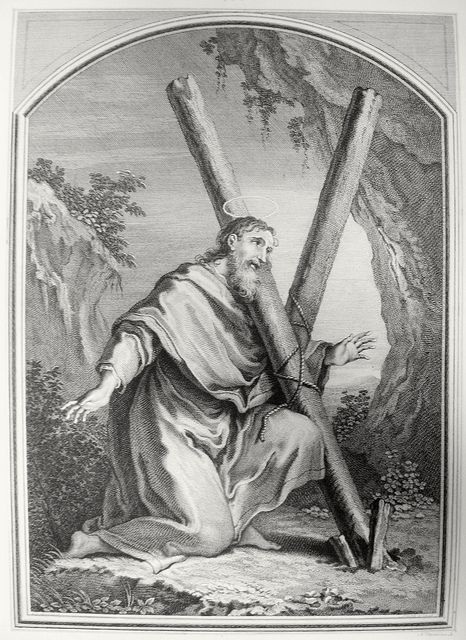 St. Andrew, by conversing with Christ, extinguished in his breast all earthly passions and desires, and attained to the happiness of his pure divine love. We often say to ourselves, that we also desire to purchase holy love, the most valuable of all treasures, and the summit of dignity and happiness. But these desires are fruitless and mere mockery, unless we earnestly set about the means. In the first place, we must be at the expense (if that can be called an expense which is the first step to true liberty and happiness) of laying a deep foundation of humility, meekness, and self-denial. “We must first, with the apostle, leave all things; that is to say, we must sincerely and in spirit forsake the world (though we live in it), and must also renounce and die to ourselves before we can be admitted to the familiar converse of our Redeemer and God, or before he receives us to his chaste spiritual embraces, and opens to us the treasure of his choicest graces. This preparation and disposition of soul it must be our constant care always to improve: for, in the same proportion that the world and self-love are banished from our hearts, shall we advance in divine love. But this great virtue, the queen, the form, and the soul of all perfect virtue is learned, exercised, and improved by conversing much with God in holy meditation, reading, and assiduous fervent prayer and recollection; also by its external acts, in all manner of good works, especially those of fraternal charity and spiritual mercy.